J. Tersoff and N.D. Lang, Theory of Scanning Tunneling Microscopy. S.-I. Park and R.C. Barrett, Design Considerations for an STM System. H.K. Wickramasinghe, Extensions of STM. J.A. 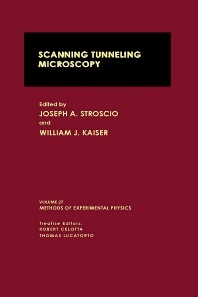 Stroscio and R.M.Feenstra, Tunneling Spectroscopy. R. Becker and R. Wolkow, Semiconductor Surfaces. Y. Kuk, Metal Surfaces. L.D. Bell, W.J. Kaiser, M.H. Hecht, and L.C. Davis, Ballistic Electron Emission Microscopy. R.V. Coleman, Z. Dai, W.W.McNairy, C.G. Slough, and C. Wang, Charge-Density Waves. H.F. Hess, Superconductors. Chapter References. Subject Index. Graduate students in physical science and engineering, especially surface science.